2009 Is Already Old News. What’s Next for the Yanks? Crucial John Sterling calls will be graded here out of a possible 35 points: 10 each for enthusiasm, duration, and catchphrase over-the-topness, with 5 points that we'll dole out at our discretion for things like "an A-Bomb for Matsui" (gaffes are part of Sterling's, um, charm). 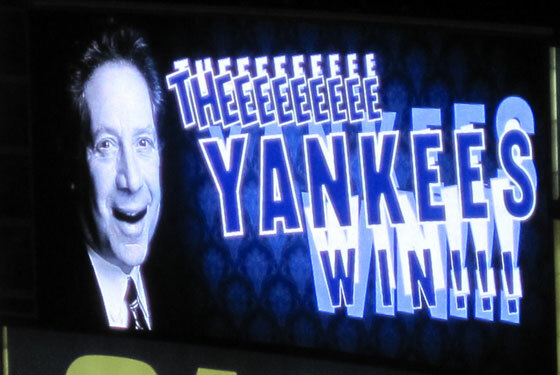 Today: The Yankees win the World Series. Enthusiasm: It's clear that Sterling is working this game on just one day's rest. He sounds tired, and the result is something you'd expect to follow a mid-May win against Baltimore, and not a World Series championship. It's an even more pitiful effort when compared to some of Sterling's other work this postseason. Listen to this compilation of "the"s compiled by the heroic Sterlingographers over at It Is High, It Is Far, It Is ... Caught. Last night's "the" just doesn't stand up. And his postscript is even more dreadful. Wake up, John! This is what you've been waiting for! 3/10. Duration: The warble clocked in at 10.05 seconds, but since official IIHIIFIIC warble measurements include extraneous words like "World Series over," this is roughly on par with the 10.62 he registered after the ALCS. A solid effort, even if he didn't step up his game for the moment of moments. 8.5/10. Catchphrases. You knew what was coming. We all knew what was coming. He gets his two points for the addition of "World Series over," but he gets no points for creativity. At the very least, "World Series over" does kind of roll of the tongue, more so than "American League Championship Series over." Syllabically, it works nicely. 7/10. Bonus Points. We get the sense that, maybe halfway through the postscript, Sterling realizes that he's blowing this call. After he's done explaining how the Yankees are the greatest franchise in this history of organized competition, he ramps up the enthusiasm just a notch to reiterate that "Once again, the 2009 New York Yankees are World Champions!" One point for the effort, even if it's too little, too late. Total: 19.5. Perhaps our expectations were unrealistically high, but we're justified in expecting a big-game performance in this situation, and we didn't get one. Perhaps it's our method of scoring — we hear your concerns, and we'll be spending the off-season tinkering with our system — but this was a disappointing effort by any objective means of analysis. But there's always next year. How many days is it until broadcasters report to Spring Training, anyway?